5x6mm side drilled "potato" shape Fresh Water Pearls combine with 7mm Freshwater Pearls, capped with Bali Silver and tiny button pearls. The 1 3/4" Small Filigree Crucifix and 5/8" Small Filigree Miraculous Medal center are antiqued sterling silver. This crucifix and center are a matched set and must be used together. All wire, chain and findings are also Sterling Silver. 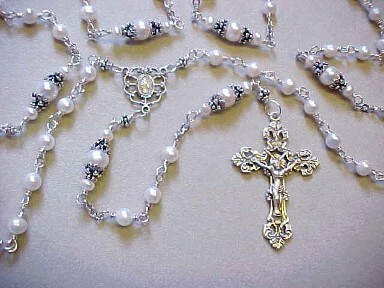 Perfect as a boys First Communion rosary! 6mm Rainbow Obsidian looks black but in the sunlight reflects colors, 8mm capped Our Fathers. The 1 3/4" Star of the Nativity Crucifix and 7/8" Immaculate Conception Center are satin finished sterling silver with engraved highlights (this crucifix and center are a matched set and must be used together). All chain, links and findings are also Sterling Silver. 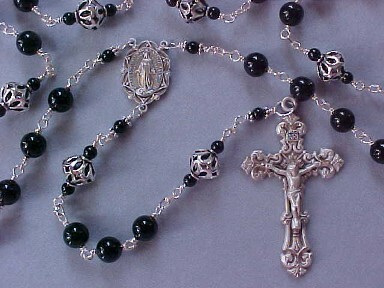 A nice rosary for a boy or a smaller rosary for a man. Also available in Mahogany Obsidian, Lapis Lazuli, Tiger Eye, Leopard Jaspar, Black Agate, or Nephrite Jade. Price will vary according to stone selected. Please inquire. Oval Fresh Water Pearls approximately 7x8mm to 8x9mm oval to pear shaped. Sterling Silver hand made Infinity design Lantern shape beads tipped with natural champagne Mother of Pearl mark the decades. (Note: The Infinity design Our Father beads are no longer available. 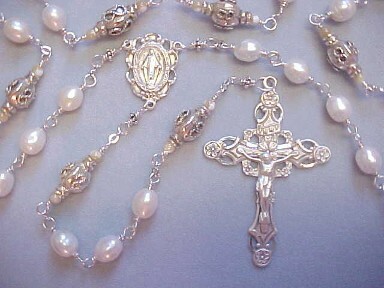 They will be replaced with a different Sterling Silver bead) The 2 3/8" Deluxe Floral Crucifix and 1" Lace Edge Miraculous Medal center (NOTE: this crucifix and center are discontinued and have been replaced by the set on Rosary #19 below) are satin finished sterling silver with engraved highlights. All wire, chain and findings are also Sterling Silver. Pearls are a recognized birthstone for June and an appropriate gift for any woman. 8mm medium - dark purple Amethyst A+/AA grade and 11X13 lampworked glass aqua with purple and lavender floral design by American bead artist Grace Ma, capped in hand made Bali Silver with small purple Swarovski and Turquoise accents. The 21/4" Deluxe Floral crucifix and 1" Floral Lace Miraculous Medal center are satin finished sterling silver with engraved highlights. All wire, chain and findings are also Sterling Silver. Amethyst is a recognized birthstone for February. 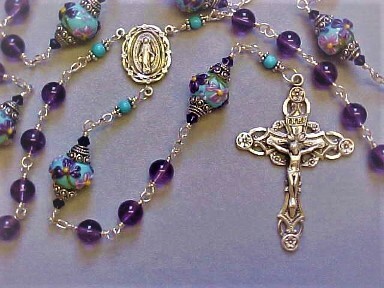 NOTE: The Grace Lampwork beads are a significant factor in the price of this rosary. 8mm Black onyx combine with large (approximately 8x10mm) hand made Sterling Silver Cut Out beads, and tipped with 4mm Black Onyx. The 2 1/4" Deluxe Filigree Crucifix and 1" Dotted Lace Edge Miraculous Medal center are satin finished sterling silver, with engraved highlights. All wire, chain and findings are also Sterling Silver. 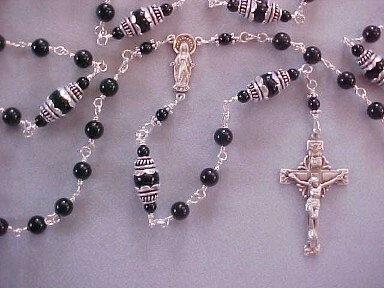 NOTE: This style rosary can also be made with any other 7 or 8mm gemstone. Price will vary according to stone selected.